Yesterday, we highlighted Haunted Empire, a new book from former Wall Street Journal reporter Yukari Iwatani Kane examining the transition Apple has undergone with the death of Steve Jobs. While the book includes a few interesting tidbits, our view was that Kane had selected anecdotes to support a predetermined conclusion that Apple is in decline. This nonsense belongs with some of the other books I've read about Apple. It fails to capture Apple, Steve, or anyone else in the company. Apple has over 85,000 employees that come to work each day to do their best work, to create the world's best products, to put their mark in the universe and leave it better than they found it. This has been the heart of Apple from day one and will remain at the heart for decades to come. I am very confident about our future. We've always had many doubters in our history. They only make us stronger. The book's release comes as Apple fans continue to wait for the first major product releases of 2014. Earlier today, the company brought back the 16 GB fourth-generation iPad as a low-end model to replace the iPad 2 and released a new 8 GB iPhone 5c in several countries to offer a cheaper option compatible with LTE networks. Update 3/18 2:22 PT: Yukari Kane has given a statement to Re/code on Cook's condemnation of her book. 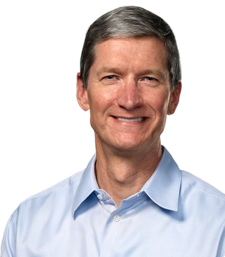 "For Tim Cook to have such strong feelings about the book, it must have touched a nerve,” Kane said. "Even I was surprised by my conclusions, so I understand the sentiment. I'm happy to speak with him or anyone at Apple in public or private. My hope in writing this book was to be thought-provoking and to start a conversation which I'm glad it has." If Cook wanted to be really subtle, they could have listed it in the iBook Store in the "fiction" section. You do your username justice. Thank you Tim. I've read 4 or 5 reviews of this book so far and all of them have panned it. I hope no one spends money on this crap. The book reads like one long sensationalist piece with a clear agenda from the start. Kane formed an opinion before she started writing. Sorry Tim, but the company is boring, and so are you! I'm just glad that he isn't the one delivering the keynotes. Thank god for Phil, Craig, and the other execs that know how to interact with a crowd. Tim with his crackely boring voice makes me sleepy, and his fake enthusiasm is annoying... :cool: He doesn't seem sincere. I have a feeling that he doesn't even know half of what he is talking about. Does he even know what the features he talks about do and why they are nifty? Still would like to see product announcements throughout the year, not all at once in September/October. One thing I've just realized about Cook. He's just as paranoid about receiving criticism and just as needy for everybody's affirmation as Steve Jobs was. Sounds like damage control, unfortunately. I can very well imagine the book tries to turn anecdotes into facts so it has more appeal (read: better $ales), but why is Tim coming out so abruptly to call it nonsense? She wouldn't sell many copies if she said the future was rosy.